Christer Betsholtz was born in 1959 in Stockholm and studied medicine at the University of Uppsala, where he also graduated with a PhD degree in 1986 and established his first independent research group. He moved to Göteborg University in 1994 and to Karolinska Institutet in Stockholm in 2004. In 2013 he moved back to Uppsala as Professor of Vascular and Tumour Biology, where he remains jointly active as Director for the AstraZeneca / Karolinska Institutet Integrated Cardio-Metabolic Centre. Christer Betsholtz was elected as a member of the European Molecular Biology Organization (EMBO) in 2004. He is also a member of Academia Europaea, the Swedish Royal Academy of Sciences and the Nobel Assembly at Karolinska Institutet. He has been recognised with a number of awards, including the Göran Gustafsson Prize, the Lundberg Medal, the Axel Hirsch Prize, and the Anders Jahre Medical Prize. Almost all of our body’s organs contain dense networks of blood vessels that supply oxygen and nutrients, remove waste products and allow rapid distribution of immune cells. Whereas the blood vessels are formed by generic mechanisms and composed of generic cell types – endothelial cells (cells that line the interior surface of blood vessels) and mural cells which envelop the surface of the vascular tube (pericytes and vascular smooth muscle cells) – the end result are capillary beds that are organotypic. They are perfectly adapted to each organ’s specific functions, ranging from absorption in the intestine, respiration in the lung and filtration in the kidney. 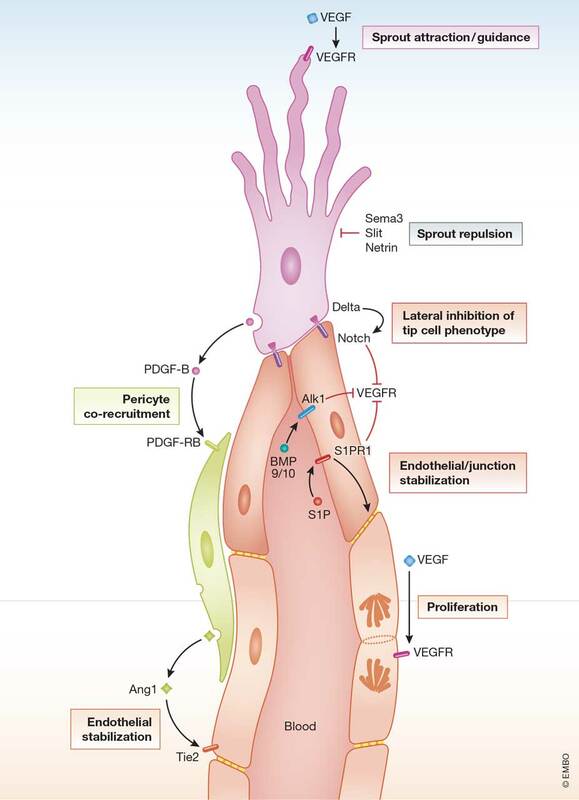 The vasculature of the CNS harbours a specialisation known as the blood-brain barrier (BBB), which protects the brain from potentially neurotoxic substances present in the blood, while allowing the passage of nutrients and molecular building blocks essential for the correct functioning of the brain. Christer Betsholtz’ work has helped explaining how blood vessels sprout in the CNS by the formation of specialised endothelial tip and stalk cells, how the endothelial cells signal to the pericytes in order to promote their co-recruitment during angiogenic sprouting, and how pericytes finally stabilise the capillaries and promote maturation of the BBB. His work has shed light on genetic causes of neurovascular diseases, and he has mapped the gene expression patterns of the brain’s different vascular cell types with high detail, opening new doors for the discovery of physiological functions and disease mechanisms in the brain.